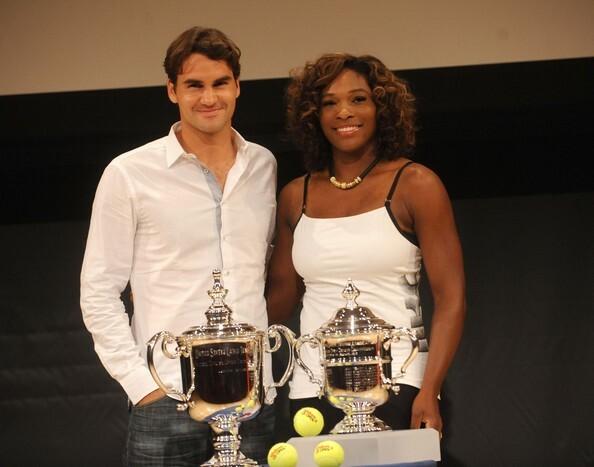 Photo courtesy of zimbio.com. Russell Wilson (pictured above) has shocked the world and been named the starting quarterback in Seattle. When Pete Carroll left USC, I lost almost all respect for the guy. The situation he left behind was inexcusable and a definite admission of some sort of guilt. That’s all in the past though. Slowly but surely, my respect has returned for the coach that picked up a pair of national titles at USC and is currently running the show in Seattle. At USC, it seemed as if everything was about the money. Just ask Reggie Bush. Since arriving in Seattle, it appears Carroll has had a change of heart. On Sunday, he named a rookie third-round draft pick the starter at quarterback for Week 1 of the regular season. As much as I try to ignore it, sports are a business. Even collegiate ones unfortunately. Money is what makes the world go round. Not in Seattle’s quarterback case though. Matt Flynn recently signed a three-year, $26 million deal, with $10 million guaranteed. Everyone and their mother expected Flynn to be the starter. 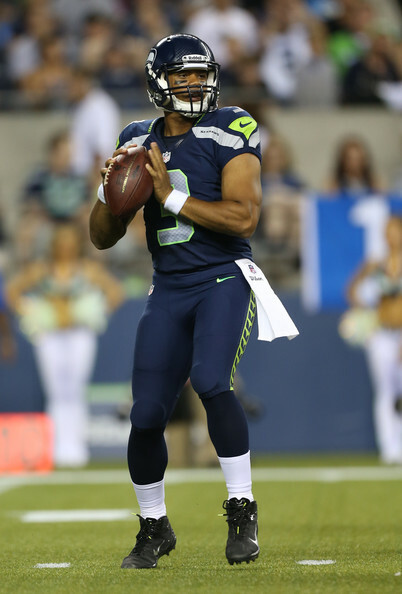 Wilson, a supposedly undersized rookie quarterback is guaranteed just $619,400. In simple terms, Flynn is guaranteed to make over 16 times the money that Wilson is guaranteed with their current contracts. Yet, Wilson is the starting quarterback. Photo courtesy of zimbio.com. 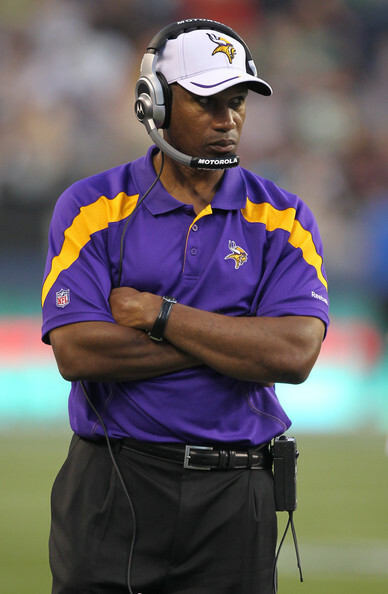 Leslie Frazier (pictured above) is one of many coaches entering the 2012 season on the hot seat. Every year in the NFL, coaches get fired. There’s no way around it. When a team is struggling, the blame falls to the head coach. Last season, Steve Spagnuolo, Tony Sparano, Raheem Morris, Tony Haley, Jack Del Rio, Hue Jackson, and Jim Caldwell were among those who were given the boot. No surprise, none of those teams made the playoffs. Which coaches have a lot of pressure on them this year? Here is my two cents. Since taking over as interim coach in 2010 for Brad Childress, the Vikings haven’t seen much improvement from Leslie Frazier. After going 3-3 in 2010, Frazier got his interim tag removed, becoming the head coach of the Vikings. In his first full season in Minnesota, the Vikings had their worst season since 1984, going 3-13. 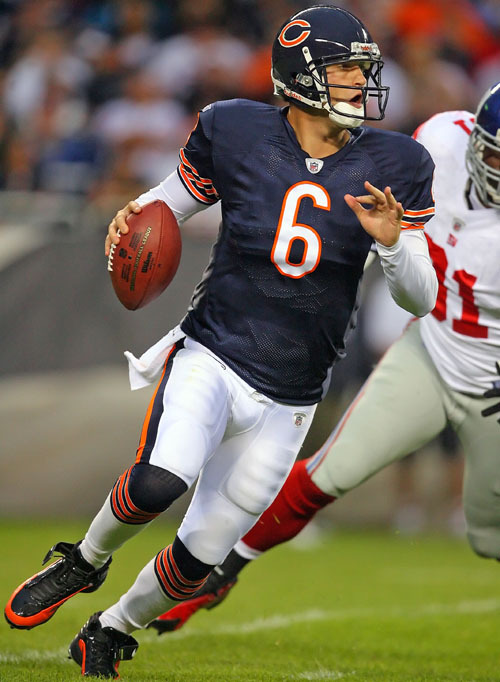 After starting the season with Donovan McNabb at quarterback, the Vikings quickly fell to 1-5. Needing a spark, Frazier turned to rookie Christian Ponder. Ponder managed to go just 2-8 in his rookie season and will be the starting quarterback in 2012. If Ponder isn’t the answer for the Vikings, that could also very well mean the end for Frazier. With Adrian Peterson coming off of a torn ACL and MCL, you have to wonder if he’ll be the same. If the Vikings start this season slow again, don’t be surprised if he gets fired. Be careful, Leslie. Will the curse apply to Megatron? Photo courtesy of zimbio.com. 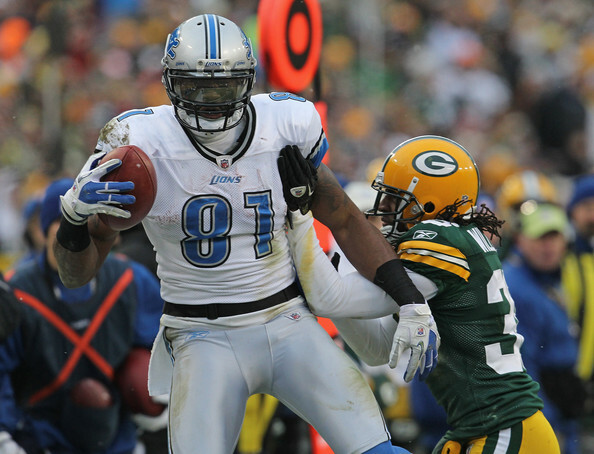 Calvin Johnson (pictured above) was unstoppable last season. Will the Madden Curse slow down the guy people refer to as Megatron? Things are good for Calvin Johnson these days. He just had a career year in which he took NFL secondaries by storm reeling in 96 catches and 16 touchdowns. The guy was simply phenomenal in every sense of the word. He lived up to his well-known nickname “Megatron.” In addition, the Detroit Lions made the playoffs for the first time since 1999. 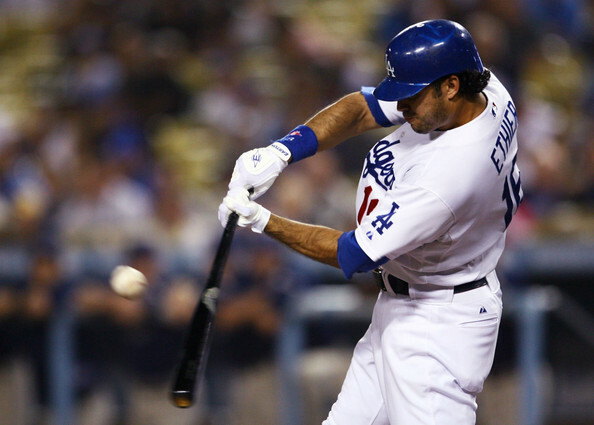 Lastly, CJ just signed a robust contract for eight years and 132 million. Things just got even better yesterday. Calvin “Megatron” Johnson will appear on the cover of “Madden NFL 2013.” A highly regarded honor for NFL players these days. Nothing is ever as good as it seems though. Don’t tell me that you are not aware of the widely known Madden curse. Photo courtesy of Cincinnati.com. 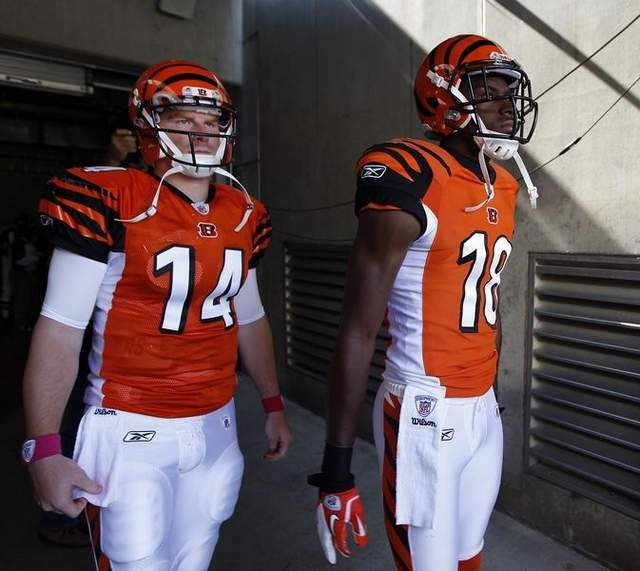 Can rookies Andy Dalton (left) and A.J. Green (right) lead Cincinnati to victory on Sunday which would result in a playoff berth? This is it folks. After a very uncertain off-season, the 2011/2012 NFL season has lived up to all of the hype and more. Without question, it has been the “Year of the Quarterback,” defined by guys like Tebow, Rodgers, Brees, Newton, Brady, and more. As is usually the case, there is still plenty to be determined in Week 17, with three playoff spots still available. Plus the winner of the second annual “TheSportsKraze Pick’em Challenge” must be determined. Grab your popcorn, because the season finale will be fun. TheSportsKraze (TSK) (defending champion)-Josh Kramer-Founder/Editor-In-Chief of “TheSportsKraze” and former ESPN intern. CV3-Chad Vordenberge-An elite high school wide receiver and a very successful business owner. CB-Craig Baker-A former collegiate baseball player and current special education teacher. DC-David Clark-A dedicated sports fan who was coached by TheSportsKraze on his fraternity flag football team. After playing for TheSportsKraze, he has developed a slow but steady motivation to show his coach who the real pick’em champion is. After Week 16, here is the scoreboard.